On Thursday, 8th March 2018, in the Old City of al-Khalil, 11-year old Ali Marwan Khaled al-Joulani went out to buy yoghurt for lunch and came back home at around 4pm. A group of soldiers were outside his building when he returned. Ali was scared so he ran up the staircase but found the front door to his apartment locked. Scared by the soldiers who started chasing after him, he continued further up the stairs onto the roof. He fell off the rooftop which is roughly 10 meters high and landed on the concrete street. Seriously injured and with a blooded face the Israeli forces, instead of administering first aid, attempted to arrest Ali. Two female neighbors, one of them pregnant, attempted to help Ali but the soldiers refused to let them near him. The women argued with the soldiers to let them help Ali, in response the soldiers raised their guns and threatened to shoot them. Despite this the women persisted that the soldiers should release Ali. After more than ten minutes the Israeli soldiers released him, and a neighbor rushed him to hospital. Ali’s right arm and right leg are now broken. His left arm is broken and requires a surgery to insert a metal plate. His jaw is broken, and he lost many of his teeth. The wound underneath his chin needed eight stitches. He is still in hospital, unable to eat anything, and requires a full-body x-ray, and at this stage a minimum of two operations for his arm and jaw. Growing up under a foreign military rule and oppression should not be the reality for any child anywhere in the world. 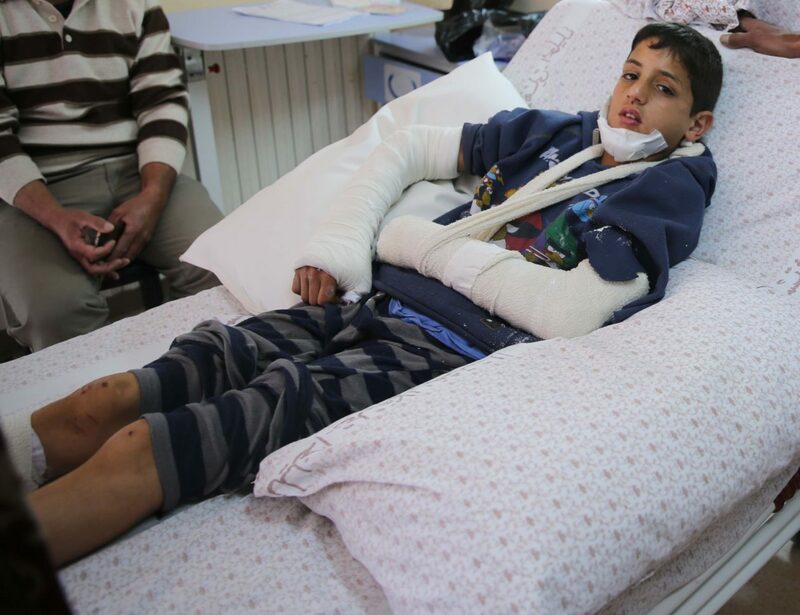 As the soldiers chased Ali, a scared child, they directly caused his fall off the roof. They then denied and prevented first aid from being administrated, despite the serious injuries he acquired. This incident illustrates how the Israeli forces show absolutely no regard for Palestinian life, even if they’re children.